Some of you probably recognized this before I did, but I’m coming to terms with the fact that I may actually have a pumpkin problem. I know. I talk about Pumpkin Spice like it’s going out of style. But that’s only because the words, “Available Only for a Limited Time” scare me to death. That’s why I felt the need to visit almost every Starbucks in town trying to find the weak-link employee who would sell me a bottle of the Pumpkin Spice syrup, only to come home empty-handed. But, I’m no quitter. So I mulled it over as I made up a batch of the Pumpkin Spice French Toast I told you about and it was then that it hit me. What if I used the Pumpkin Spice Glaze as a syrup for my coffee? A cup of coffee, just the right amount of cream, some glaze to sweeten to taste, and maybe even a little whipped cream and cinnamon on top, and I may just be set until Peppermint Season. Mix together sugar and milk until smooth, then mix in pumpkin and spice. Keep refrigerated until ready to use. Sound good to you, too? We may need to start a support group. I’ll bring the Pumpkin Muffins. This entry was posted in Uncategorized and tagged Fall, Recipes. Bookmark the permalink. Follow any comments here with the RSS feed for this post. Post a comment or leave a trackback: Trackback URL. I better not try one of these. I'm already sadly addicted to the available-for-one-month-only Dairy Queen Pumpkin Pie Blizzard. I'm trying to keep myself down to only twenty this year. My name is Susie and I'm addicted to pumpin pie. Thanks for leading a group. I will bring mini pies for everyone! Not that this will help you end your addiction, but I just bought Elizabeth Grady Pumpkin Scrub for my face! See if Mrs. Ryan can pick some up for you–it is sold at all the Elizabeth Grady salons around Boston. It smells so good that you want to eat it! But it will keep the pounds off and your face looking beautiful! Believe it or not, I was not sold on pumpkin spice lattes until last week. I think the first one I tasted a few years ago was either not made properly or was just not what I expected. Last week I stopped at a Starbucks that had samples of the pumpkin spice latte and I thought I'd give it another shot because I know so many people who absolutely go crazy for it. And while I'm not sure I'm a full fledged devotee, I'm definitely more willing to try another. I'll have to see if I get up the guts to make your pumpkin glaze to try in my morning coffee. How much does it make? Or rather, how many cups of coffee will it last for? 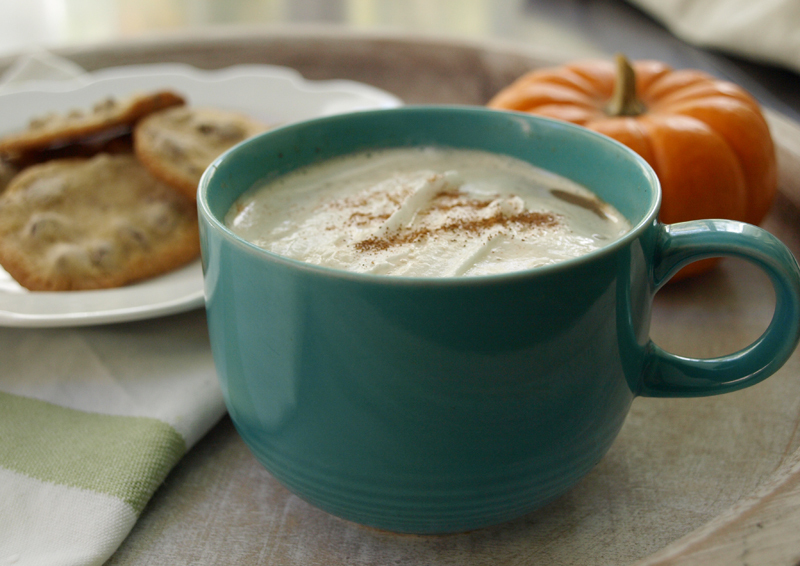 This recipe will make about a cup of glaze, so that should make several cups depending on how sweet you like your coffee 🙂 Glad you've jumped on the pumpkin wagon with the rest of us! Add another pumpkin devotee to the roster. This looks so good especially along side the french toast. Thank you Julie! This is amazing! LOL! That was me 4 years ago AND a friend of a friend was going to sell me the pumpkin syrup BUT it came in a 5 gallon container only – that seemed slightly obsessive (if I had known you then, we could've split it!!). I have been told that I have a pumpkin obsession problem. I don't see how it is a problem, though. I love pumpkin anything. I buy Thomas' Pumpkin Spice Bagels & English Muffins, Country Crock Pumpkin Spice Butter, Eggo Pumpkin Spice Waffles, I made pumpkin pancakes last week, and I put pumpkin pie spice in with my coffee grounds before I brew on a regular basis. Thank you for sharing the pumpkin love!